A relatively large tarball on a boulder. What are tarballs, and how do they form? Tarballs, the little, dark-colored pieces of oil that can sometimes stick to your feet when you go to the beach, are often remnants of oil spills but can also be produced from natural seeps, places where oil slowly escapes from the earth surface above some petroleum reservoirs. Tarballs that appear on central California shores during the winter months often originate from southern California seeps on the seafloor. When crude oil (or a heavier refined product) floats on the ocean surface, its physical characteristics change. During the first few hours of a spill, the oil spreads into a thin slick. Winds and waves tear the slick into smaller patches that are scattered over a much wider area. Various physical, chemical, and biological processes change the appearance of the oil. These processes are generally called "weathering." Initially, the lighter components of the oil evaporate much like a small gasoline or diesel spill. In the cases of heavier types of oil, such as crude oil or home heating oil, much of the oil remains behind. At the same time, some crude oils mix with water to form an emulsion that often looks like chocolate pudding. This emulsion is much thicker and stickier than the original oil. Winds and waves continue to stretch and tear the oil patches into smaller pieces, or tarballs. While some tarballs may be as large as pancakes, most are coin-sized. Tarballs are very persistent in the marine environment and can travel hundreds of miles. How long will tarballs remain sticky? 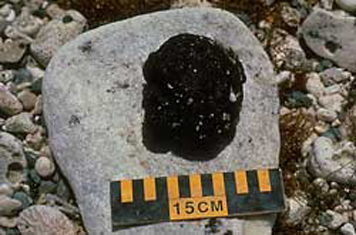 Weathering processes eventually create a tarball or flattened tar patty that can be hard and crusty on the outside and soft and gooey on the inside, not unlike a toasted marshmallow. Turbulence in the water or beach activity from people or animals may break open tarballs and patties, exposing their softer, more fluid centers. Scientists have not been very successful at creating weathered tarballs in the laboratory and measuring the thickness of the crusty outer layer. Therefore, we don't know how much energy is needed to rupture a tarball. We do know that temperature has an important effect on the stickiness of tarballs. As air and water temperatures increase, tarballs become more fluid and, therefore, sticky--similar to an asphalt road warmed by the summer sun. Another factor influencing stickiness is the amount of particulates and sediments present in the water or on the shoreline, which can adhere to tarballs. The more sand and debris attached to a tarball, the more difficult it is to break the tarball open. These factors make it extremely difficult to predict how long a tarball will remain sticky. Are tarballs hazardous to your health? For most people, an occasional brief contact with a small amount of oil, while not recommended, will do no harm. However, some people are especially sensitive to chemicals, including the hydrocarbons found in crude oil and petroleum products. They may have an allergic reaction or develop rashes even from brief contact with oil. In general, we recommend that contact with oil be avoided. If contact occurs, wash the area with soap and water, baby oil, or a widely used, safe cleaning compound such as the cleaning paste sold at auto parts stores. Avoid using solvents, gasoline, kerosene, diesel fuel, or similar products on the skin. These products, when applied to skin, present a greater health hazard than the smeared tarball itself. How are tarballs removed from affected beaches? There is no magic trick to making tarballs disappear. Once tarballs hit the beaches, they may be picked up by hand or by beach-cleaning machinery. If the impact is severe, the top layer of sand containing the tarballs may be removed and replaced with clean sand. Are there more tarballs on beaches along the East Coast than on the West Coast? The number of tarballs found on a beach depends on several factors: tanker traffic, wind patterns, sea currents, whether an oil spill occurred recently, natural seeps, and how often the beach is cleaned. Obviously, some regional beaches may have more tarballs than others, but to our knowledge, there is no general agreement that beaches along one particular coast are more polluted with tarballs than beaches along another coast of the United States. New tarballs appearing on a beach may indicate an oil spill. If you notice unusual numbers of tarballs on the beaches, call the U.S. Coast Guard any time at 800.424.8802. Agency for Toxic Substances and Disease Registry. 1999. Toxicological Profile for Total Petroleum Hydrocarbons (TPH). Atlanta: U.S. Department of Health and Human Services. 231 pp. Fingas, M.F., W.S. Duval, and G. B. Stevenson. 1979. The Basics of Oil Spill Cleanup. Hull, Quebec, Canada: Minister of Supply and Services. 155 pp. Payne, J.R., and C.R. Philips. 1985. Petroleum Spills in the Marine Environment: Chemistry and Formation of Water-in-Oil Emulsions and Tar Balls. Chelsea, MI: Lewis Publishers. 148 pp.